Ten Strawberry Street Giardano Clear and Gold Glass Charger Plate 13-1/4"
Home > Products > Ten Strawberry Street Giardano Clear and Gold Glass Charger Plate 13-1/4"
Provide a sophisticated and elegant backdrop for your specialty dish with the Ten Strawberry Street Giardano Clear and Gold Glass Charger Plate 13-1/4". 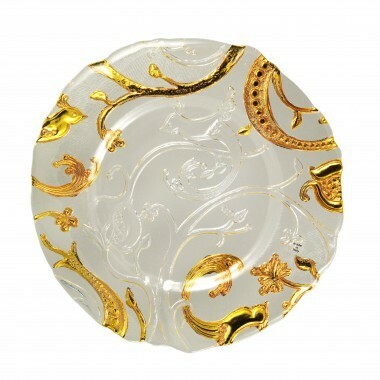 Beautifully accented with an artisan-inspired pattern in stunning gold and clear overlay, this one-of-a-kind charger plate looks great beneath dinner plates, platters, and bowls. Thanks to its high quality glass construction, this charger plate boasts superior craftsmanship that combines a delicate look with exceptional strength. Perfect for lavish parties, wedding receptions, and fine dining restaurants, this charger plate not only complements any table setting but also protects against spills and mess.